The Canadian “Créateur d’Harmonies” François Chartier has been mandated by the Director of the famous Picasso museum of Barcelona to create an aromatic sensory journey, inspired by 10 works (sculptures and paintings) of Picasso, selected by Chartier. For the experience to be unforgettable, the author of Taste Buds ans Molecules is associated with SONY in Japan, and thus has used their innovative “SONY AROMASTIC” to put the picassian works in aromas. Chartier thus has created guided aromatic visits of the exhibition “PICASSO’S KITCHEN”, which opened on My 25 and will continue until September 30. 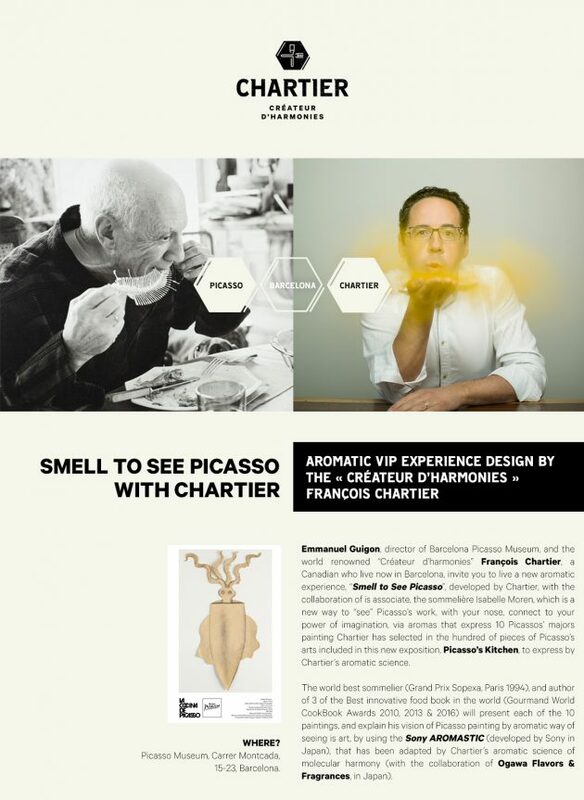 “SMELL TO SEE PICASSO” is therefore unique and innovative aromatic experience, a new day to see Picasso by the olfaction, through the science of molecular harmonies and sommelerie created by Chartier in 2004.